I was able to customize these 100% recycled pens just the way I had hoped. Thanks for the unique promotional opportunity. Ordered these for a corporate trade show and they were great! My company imprinted our logo and design on these pens and we couldn't be more satisfied with the outcome. They market my business while being completely versatile. Really nice options when customizing these pens. We could create a really unique promotional item. A very simple, cheap way to gain exposure. Can't ever have enough pens with your brand imprinted on them. You never really know who's hands they will end up in. In knowing that we are really promoting our brand through several different means. Personalizing these pens for the entire school district was actually a pretty cool experience. We implement an eco-friendly approach to a necessary item. We give these away at all our corporate gatherings. Its really the most cost effective way to promote our brand and stay within an earth-friendly mind set. It was nice to be able to create several different virtual samples to see how the finished product would look. That's a great option to have for consumers. Top of the line customer service at Custom Earth Promos. So many great items on this site. I've ordered several different ones, and I'm always very satisfied. The pricing and eco-friendly premise was really satisfying to all those involved in this project. EP7 is an awesome tool for us and our marketing campaign. Cost effective and eco-friendly way that gives us the ability to gain exposure, and compete with our competition accordingly. Take advantage of our retractable pens as your next big promotional leap to success! Deemed eco-friendly from their production use of 65% recycled plastic and offered in a variety of stylish colors and ink options, you will have the perfect product to represent your brand in a unique way! 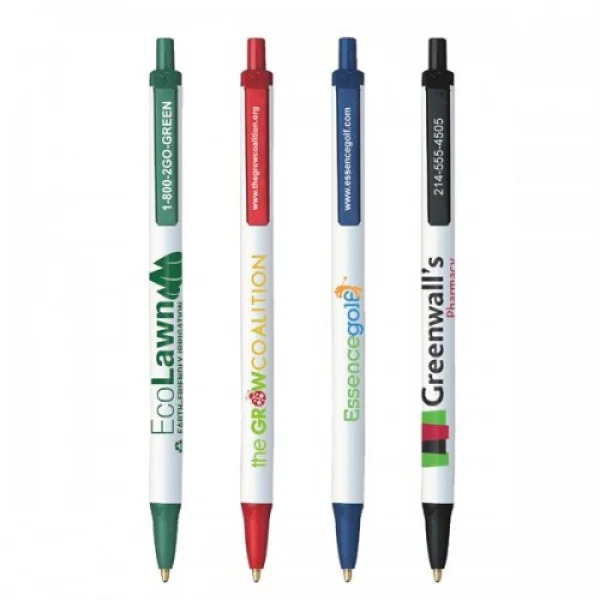 Our BIC Customized Recycled Retractable Pens are the perfect platform to market your business as they undergo an eco-friendly production process, they are pleasing to the eye and are appealing to all consumers considering their highly practical usage. Choose from the multiple customizing options to perfectly compliment your brand logo or design. With two impressive imprinting regions on the pen clip and barrel, your brand will speak for itself. Hand them out at your next corporate function, business event and/or tradeshow to maximize your brand recognition. Enhance your business’s visibility with a reliable product at a low cost that targets all consumer audiences! At Custom Earth Promos, we place our primary importance on the quality and safety of our products. These promotional pens undergo a series of tests to ensure the absence of harmful ingredients, such as lead. We have safety specialists on staff that review each product to make sure they abide by the regulations under the California 65 proposition, which outlaws the presence of toxic pollutants and chemical sin consumer products. Our aim is to provide businesses with a safe and premium-quality product to engage in brand marketing for your business recognition to flourish! We offer a virtual sample tool, which enables you to create a digital prototype of your customized pen that includes the upload of your logo or text that you wish you to embed onto the imprint areas. You have multiple customizing options including the layout details, the trim colors, the location of your logo imprint as well as choosing from the various ink colors. Play around with the various design options we offer until you find the perfect promotional platform for your business. Once you finalize your product, send your creation over to us, so we can begin our production process. Our typical manufacturing process is around 5 business days. If you have any questions or would like some suggestions for your promotional product, we would love to help! Feel free to contact us by phone or email at any time.